SAVE $12! Available with Felt Box Liner or the Merle Clamp. 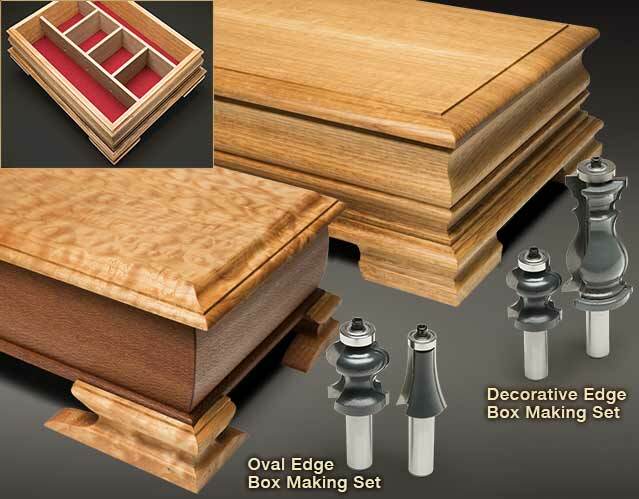 Includes two carbide tipped router bits: Traditional Foot bit #8588, and The Traditional Foot bit creates a stylish foot for the box and the Furniture Maker bit puts a curved profile on the box case. Furniture Maker bit #8592. Set #8584 includes Felt Box Liner (color may vary). 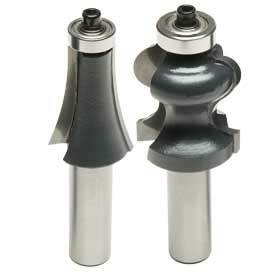 Set #8586 includes the Merle Band Clamp, which applies uniform pressure when gluing. Save $12! Includes #8588, #8592, and Felt Box Liner. Save $17! Includes #8588, #8592, and #9012. SAVE $19! Available with Felt Box Liner or the Merle Clamp. 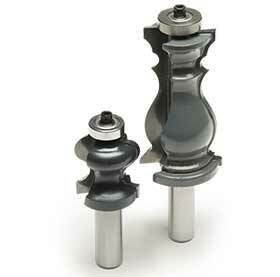 Includes two carbide tipped router bits: The Traditional Foot bit #8588 and Mitered Door Frame bit #8782. The Traditional Foot bit creates a stylish foot for the box and the Mitered Door Frame bits puts a decorative profile on the box case. Set #8585 includes Felt Box Liner (color may vary). Set #8587 includes the Merle Band Clamp, which applies uniform pressure when gluing. Save $19! Includes #8588, #8782, and Felt Box Liner. Save $24! Includes #8588, #8782, and #9012. I did a quick box out of cedar with this bit and it's very attractive. You need to have extra wood above and below the bit so it rides right on the fence. Take small bites, which takes awhile. Also had to add a board to the fence as the bit is wider than the 3/4 original fence. Push sticks are critical for good and safe results. I'm still trying to figure out how to route a 4 sided foot with the foot bit. That last side could be dangerous.